To me, it seemed strange to find the Hindu god Vishnu inside the Buddhist temple of Angkor Wat. When construction of Angkor Wat was begun in the 12th Century it was designed to be the state temple of the Khmer kingdom whose citizens at the time were Hindu. When the Khmer’s changed to Theravada Buddhism in the late 13th Century the head of Vishnu was removed and replaced with Buddha’s. 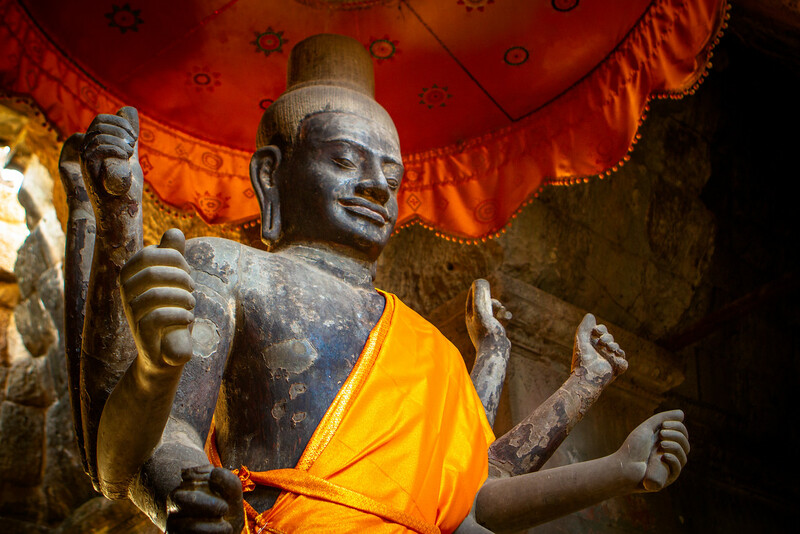 The impressive 5-meter tall statue is carved from a single piece sandstone and eight centuries later still considered important to celebrants at Angkor Wat. Every day worshipers maintain the gold clothing and bring symbolic offerings to show gratitude and contemplate life. I missed that when I was there. Gorgeous photo Jonathan. Is it in the main Angkor Wat temple in a row with others near what used to be baths or swimming pools…if so I did see it. Hi Tim, Yes I am sure you saw it. It is right in the heart of the main temple. Sometimes it is crowded there, other times there is no one there at all. Sometimes eerie with all the incense and flower offerings.